If you are new to the world of DIY or home improvement and you are thinking of remodelling your bathroom, you may be confused by some of the terms used by the trade to describe certain bathroom objects and also what certain objects are. 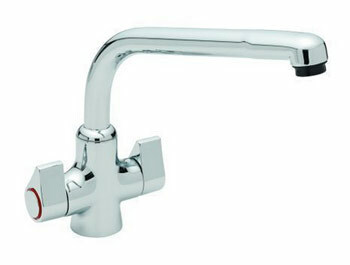 For example, how does a monoblock tap differ to a mixer tap? With this in mind, we are here to help you by explaining what some of the terms used by the trade refer to and also what certain objects are. Are you planning a new bathroom, and baffled by the terminology? 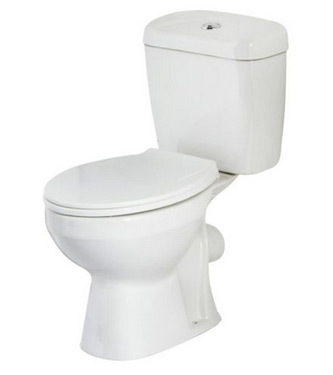 Do you need to know the difference between a close coupled cistern and a back to wall toilet? Use this Glossary of Bathroom Terms to take the mystery out of plumbing, planning, and purchasing bathroom ware. 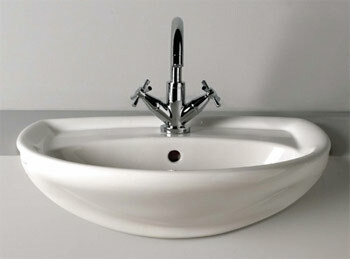 Some bathroom basins are asymmetrical or offset. So when you look at them from above they are not symmetrical. The bowl of the basin is off to one side and there is a small shelf or tap seating on the opposite side. Sometimes the unit may incorporate a drawer or towel rail too. This is where the pan or base of the toilet fits against the wall, and the cistern is not visible. This may involve building a false wall or using a cabinet to hide the cistern. This give a clean streamlined look to the bathroom, but bear in mind that you may need to get access to the cistern so if it is fitted into a false wall you should allow for some sort of maintenance access. This is a tap that mixes hot and cold water through one spout into the bath tub. This allows you to fill the bath to a comfortable temperature from one tap fitting. 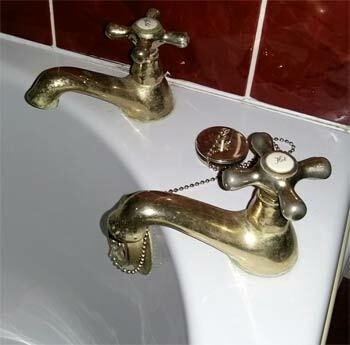 It may have one inlet hole and mix the hot and cold supply under the bath, or two separate ones – one hot and one cold and mix them in the tap. They will be advertised as a one or two tap hole option accordingly. 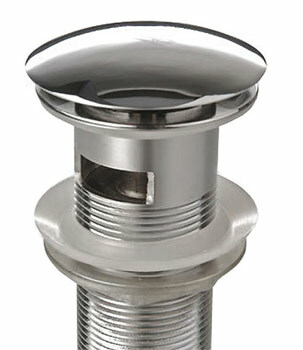 A single tap fitting that has hot and cold inlet and mixes the water in the body of the tap. 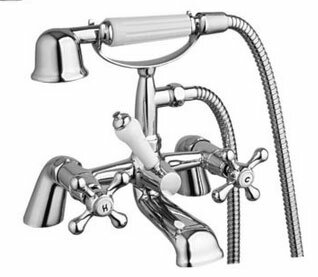 It has a spout into the bath tub, plus a shower head with a valve that switches between the tap spout and the shower head. Baths can be made of acrylic, ceramic, enamelled steel, and occasionally stone or even wood. 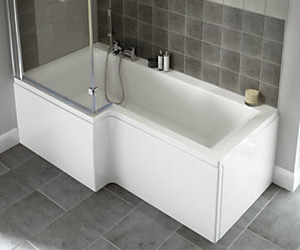 The bath tub itself can vary in size but standard lengths are 1700mm 1600mm and 1500mm. Normal widths are between 700mm and 800mm but again this can vary depending on the design. Corner baths and offset baths are also available and may fit into difficult sized or shaped rooms better than a conventional bath. A bidet looks a little bit like a toilet pan and is designed for washing intimate parts of the body, although it has been known for people to use it to wash their feet. A door or screen that folds in half to open, and often slides to one side. This is a term used for shower screens and shower doors. A bottle trap is a waste trap for a basin which is designed to be seen and is used where there is no pedestal. This is a term for taps and wastes. Although the finish is often chromed the interior is usually made of brass because it can be precision engineered and will not corrode when wet. A cistern is a tank for holding water. 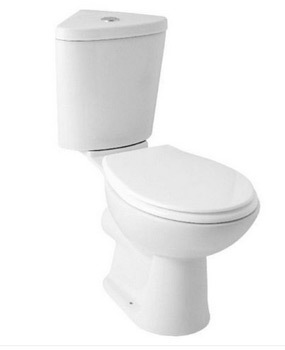 A toilet cistern usually sits on or near the pan and has a connection to allow it to flush the toilet. See back-to-wall toilet, close coupled and low rise for more information. This means that thee cistern is stitting directly onto the toilet pan. 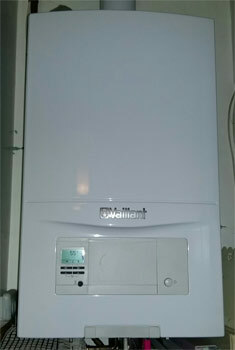 The benefit is that it forms a very compact unit which sits low on the wall. 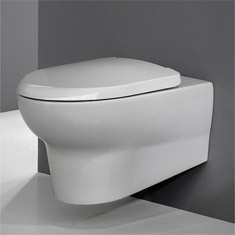 Often close coupled toilets are designed so that they appear to be one single unit. 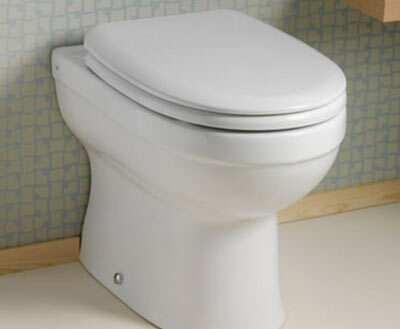 These are now the most popular types of toilet sold in the UK. It is vital that the toilet is sitting on a completely level surface otherwise the joint between the cistern and the pan may leak. We have an entire project devoted to explaining combination boilers, but in a nutshell they are pressurised systems which generally operate between 0.8 bar and 1.5 bar of pressure. It is always recommended to check what your manufacturer stipulates as the optimum working pressure before you set the pressure on your system. This is a term for a toilet that has a slightly higher pan, making using the toilet slightly easier for those with mobility issues. Corner baths come in various sizes and are often used to give a full sized tub while taking up less wall length. They are ideal for bathing children, and give a good wide base for using a shower over the bath. Some models have a seat built into the corner section, to make it easier to wash you feet, presumably! Standard sizes for corner baths are 1500mm x 1500mm, 1200mm x 1200mm, or 1050mm x 1050mm, but other sizes are available so it is worth shopping around to find one that fits in best with your room plan. Offset corner baths are also available. This basin sits on top of a counter, which could be the top of a vanity unit, storage unit or even a shelf. The basin has a central waste outlet (plug hole), and may not have an overflow, unlike conventional basins. Taps may be fitted to the basin, wall or the countertop, depending on the style of the basin and yrou personal preference in terms of styling. 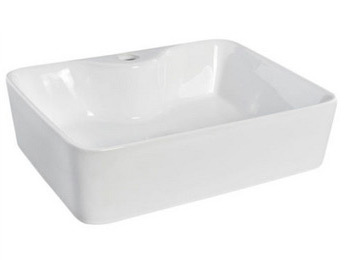 Some are designed to look like they are simply sitting on the counter-top and are sometimes referred to as vessel basins. This type of shower allows you to pick a temperature of water that suits you and at the touch of the button the shower will mix hot and cold water at the correct amounts to supply water at a temperature that is just right for you. These are designed to save water when you only need a short flush, shall we say when the contents are just liquids? The short flush will typically use 3 or 4 litres of water. New UK regulations require a full flush to be less than 6 litres of water. Electric showers take water from the cold supply and heat it on demand when you turn the shower on. The greater the wattage of the shower the better the flow of hot water you can expect. This term referrers to shower screens and shower cubicles. This normally encapsulates the shower, allowing you to keep any and all water within the enclosure, preventing it from soaking the rest of the room it is located in. This normally sits on top of a shower tray. This is where the mains water is fed into a tank at high level – usually in the loft, or in an airing cupboard. This usually delivers a low pressure of water but if you want greater pressure you can usually install a pump for a shower or even to increase water pressure to the taps. If you need to calculate the water pressure from a gravity-fed system you can work it out by checking how high the water tank is above the shower or tap. If it is 2 meters above the shower it will deliver 0.2 bar pressure, if it is 5 meters it will be 1.5 bar. Care should be taken to work out pressure on the system when buying showers and pumps to make sure they will work effectively with the system you have. You may wish to take advice from a plumber to be sure you have your calculations right. Showers marked as high pressure are suitable for high pressure systems (such as a combination boiler, or unvented system). Showers marked low pressure are suitable for use on a low pressure system (such as a gravity-fed system). 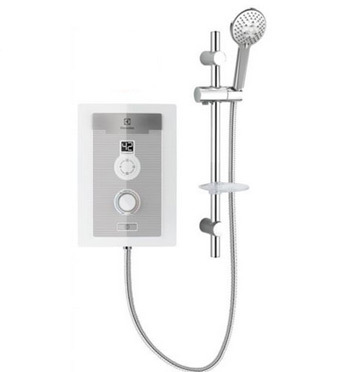 A mixer shower takes the hot and cold water supply and mixes them within the shower unit to give you a shower at a temperature that you can control to suit your needs. Manual mixers are most common and rely on you adjusting hot and cold to suit your needs, digital showers and thermostatic showers are also available. They come in units that are surface mounted, or can be fitted into the wall, known as recessed. A single body tap fitting which only needs one inlet hole. It takes water from the hot and cold supplies and mixes them at equal pressure. 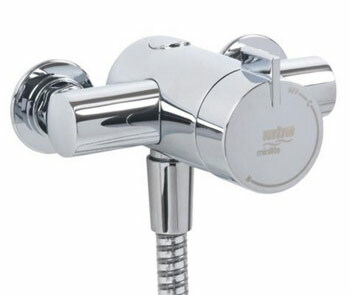 The temperature and flow are easily adjusted using the lever on top of the fitting. 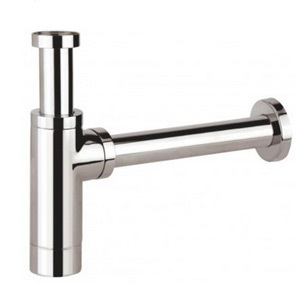 These types of tap are suitable for kitchens, bathrooms and cloakrooms. 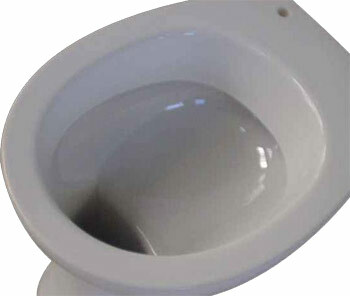 This is a toilet pan that can be connected to any of the three toilet outlet systems. With the correct plastic outlet fittings they can be attached to and S-trap, P-trap or bottom outlet waste outlet system. Like a corner bath an offset corner bath will not be as long as a conventional bath, because the actual tub is set at an angle. They are basically triangular in footprint, with a curved front edge and the two other edges being of different lengths. They are often used in ensuite bathrooms or where space is limited to give flexibility of design. 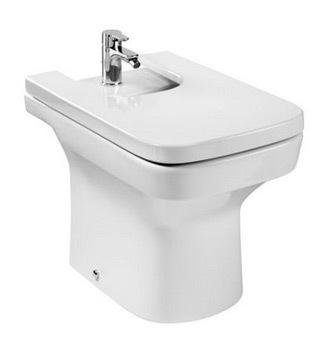 A term for the base of the toilet (the bit that you sit on), directly below the toilet seat. A pivot shower door swings open on a supporting upright bar or brackets. The plug on a chain is history with these systems which have an operating rod to raise and lower the plug either by moving a lever or turning a knob. They are available for basins and baths. The rod is concealed behind the taps, and basin or tub and so gives a tidy finish with clean lines. Some systems operate by pressing the plug to close and pressing again to pop up and let the water out. The downside of these systems is that you have to put your hand back in the water if you forget to do it while you are using it! The power part of the power shower comes from a pump in the system. This type of shower takes hot and cold water and mixes them to the desired temperature before pumping the water through the shower head. This usually gives a stronger flow of water than you would get from an electric shower. See our project on power showers. This is usually applies to showers and is a triangular shape with a curved front edge. Basically it is a wedge from a circle – like a big slice of pie! Quadrant sizes are given as a radius and standard sizing is 800mm or 900mm radius. Sanitaryware is a term for bathroom fittings that include toilets, bidets, baths and basins. These are not very common water systems, but are becoming increasingly used in flats and houses where space is limited as they do not require a cold water tank or cistern. They have a hot water tank which is under pressure, and usually delivers water at about 3 bar. 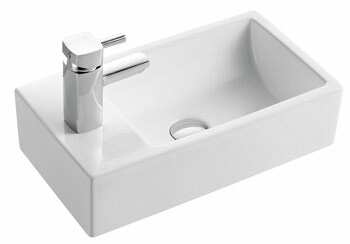 This is a fitted basin that is partly set into a bathroom furniture unit. The front of the basin extends out beyond the front of the unit and some people find this easier to bend over than a fully recessed basin. 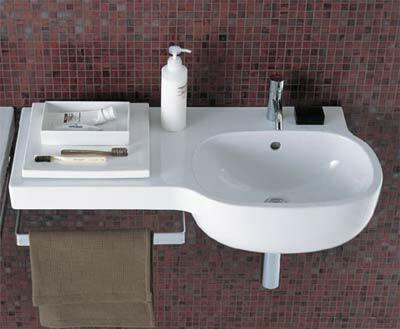 This is term for bathroom sanitary ware that has been designed for small spaces. So a short projection basin will be small from front to back, a short projection toilet will be narrower from the wall to the end of the rim. 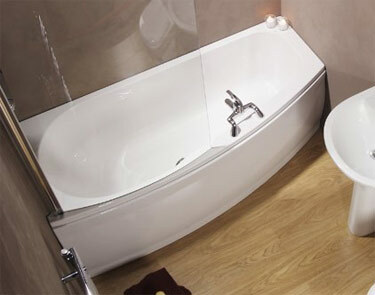 These baths are designed with more room at one end either by being formed into a P shape or an L shape. The wider end is designed to give more space to shower and are typically 800mm or 900mm wide at the widest end. They come as a left hand or right hand option and may be available in various lengths to suit the size of the bathroom. Sizes vary between manufacturers so shop around to find one that best suits your needs. 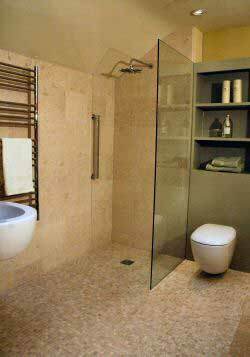 A shower door which consists of two or more panels which slide to one side to allow you in and out. 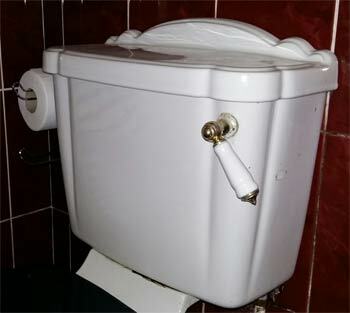 This is a hydraulic closing mechanism that slowly closes doors and drawers or gently lowers toilet seats rather than allowing them to bang shut. 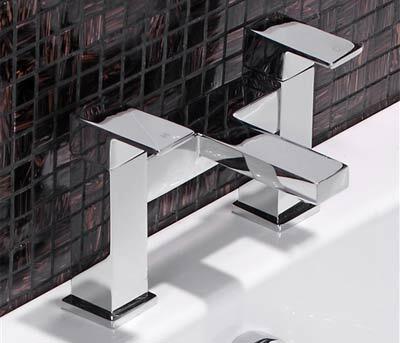 The mechanism is hidden inside the hinge or runner and it gives a luxurious feeling finish to the bathroom fittings. These are baths that taper at the foot end to give more room where there is limited floor space. Sometimes they are shorter than a traditional bath too. 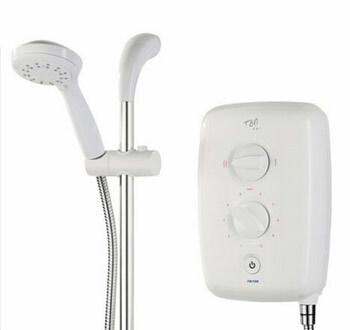 A shower with a thermostatic valve can changes in water pressure and will adjust the hot or cold intake to compensate. This means that if someone else if drawing water elsewhere in the house you do not get a blast of freezing or scalding water mid-shower. 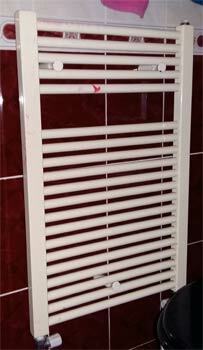 There are many styles and finishes of towel radiator available now. They are connected to the central heating system, and aredesigned to be attractive as well as functional. They often have spaces to hang towels through the bars, to dry and warm them, as well as heating the room. Make sure you pick a radiator that is big enough for the room if this is going to be the only method of heating. You can also have an electric element to make the unit into a heated towel rail which can be used even if the central heating is not on. This type of shower enclosure has a screen or screens but does not have a door or curtain that you need to close to use the shower. These basins are hung on brackets and have no pedestal. They can make a bathroom appear less cluttered and more spacious. This style means the trap beneath the basin is on show and so you should choose one that is chrome or coloured rather than the basic black or white plastic that is usually hidden by the pedestal. These types of toilets have a pan that is hung on brackets from the wall rather than standing on the floor. The cistern is usually separate from the pan and concealed in the wall. This type of fitting gives a stylish, minimalist finish, especially if combined with a wall hung basins, and they can make the room appear bigger. It also makes the floor easier to clean. This is a shower that does not have a shower tray, but the water drains into a drain in the floor. Sometime the shower is open to the rest of the bathroom and sometimes it is separated by wet room panels (essentially a fixed shower panel). We will continue to add terms to our Bathroom Glossary as we progress, but the above should cover the main terms to get you started. Choosing Ceramic Tiles for Tiling Projects in Kitchens and Bathrooms – Which Tiles Do I Need? Choosing Ceramic Tiles For Tiling Projects In Kitchens And Bathrooms - Which Tiles Do I Need?